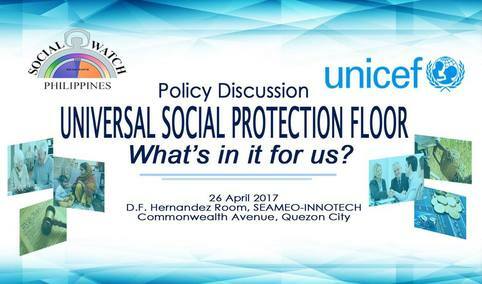 Social Watch Philippines (SWP), in partnership of the United Nations Children’s Fund (UNICEF Philippines) will conduct a policy discussion entitled 'Universal Social Protection Floor (USPF): What's in it for us?' today, April 26 to be participated in by the International Labor Organization (ILO), key national government agencies, CSO representatives, academics, civil society organizations and other stakeholders. SWP co-convenor Dr. Ma. Victoria Raquiza said that this event is important as we have observed a lack of policy traction, and even awareness of the USPF among policy makers, civil society organizations (CSOs) and social movements in the country. “The universal and potentially ‘transformative’ character of the USPF has broad appeal to many rights-based advocates, including SWP both at global and national levels, and as such, we would like to promote it” she explained. SWP has invited speakers from the International Labour Organization to give a talk about international trends on universal social protection and the National Economic and Development Authority to discuss the Philippine government’s past and current initiatives on the USPF. UNICEF will also present its approach to social protection. The panel of reactors will come from the Department of Social Welfare and Development, National Anti-Poverty Commission, and the Confederation of Older Persons Associations of the Philippines (Copap Elderly). Dr. Raquiza said that social protection initiatives in the country remain fragmented, inaccessible and unreachable to many Filipinos. “While acknowledging the strides made in social protection such as through the conditional cash transfer program (Pantawid Pamilya), PhilHealth and pensions for the elderly, these programs need to be rationalized as part of a broader developmental, integrated and rights-based social protection scheme”. “In this context, SWP aims to promote and deepen awareness on the USPF with a view to increasing ownership of both the concept and possibly its practice in a Philippine context,” Raquiza stressed. “We hope that this policy forum will spark increased awareness and interest in the USPF and eventually receive the policy attention it deserves,” Dr. Raquiza concluded. Social Watch is also a member of the Global CSO Coalition of the Universal Social Protection Floor. Anti-pork groups found 2017 Budget still far from "real change"